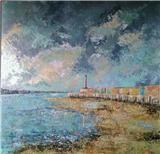 I am a painter living in the City of Canterbury and many of my works are influenced by the Kent landscape. There are so many beautiful locations around this part of Kent, countryside and coastlines, and I try to capture the subtleties of the natural landscape within my work. I am fascinated by the changes of light texture and richness of colour within the natural landscape and I find this a constant source of inspiration. I am constantly observing the skies, trees and hedgerows around me and feel compelled to recreate what I see and feel. I love the changes in light, colour and mood that each season brings and I try to capture that within my work. I have exhibited widely throughout Kent and in Europe and I have undertaken a number of commissioned works. I am always overwhelmed by the positive feedback I receive from the public and it is truly satisfying to know that people get pleasure from looking at my work.